The Department of Veteran Affairs' inspector general is reviewing whether the agency flouted regulations on dog experimentation, as a new bill was introduced to outlaw the often-gruesome testing for good. In a letter to a bipartisan group of lawmakers, VA Inspector General Michael Missal said his office will probe whether nine ongoing dog studies were being carried out in violation of a law signed by President Donald Trump last year. That law said the VA secretary had to sign off on any such procedures, which animal advocates and members of Congress say are painful and unnecessary. The IG's letter was first reported by Stars and Stripes. The VA maintains former Secretary David Shulkin signed off on the experiments verbally on the day he was fired by the president, but Shulkin has denied that claim. He told USA Today in November that he "wasn't asked, nor did I request a review for an approval" of the dog experiments. 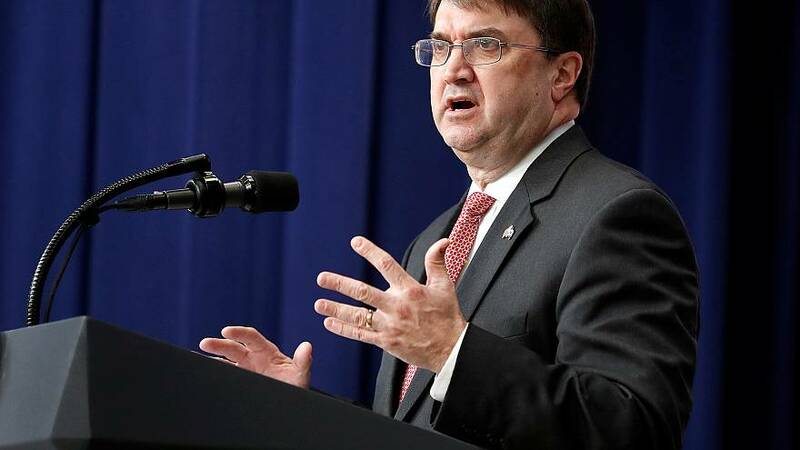 In a letter last year to Rep. Dina Titus, D-Nev., current Secretary Robert Wilkie said the experiments include "critical research to investigate how to restore the ability of Veterans with traumatic spinal cord injuries to breathe properly and avoid repeated bouts of pneumonia and early death." The current experiments include forced heart attack experiments at a veterans' center in Richmond, Virginia, and tests involving damaging dogs' spinal cords and collapsing their lungs in Cleveland in an effort to see how their cough reflexes respond to electrode treatments, according to the White Coat Waste Project, an animal advocacy group. A past VA experiment involved drilling into live dogs' skulls. The agency did not immediately respond to a request from comment from NBC, but told USA Today the testing has led to a breakthrough on cough restoration for paralyzed vets, and has helped researchers better understand links between heart rate irregularities and heart disease. The agency also maintains it only uses dogs for the tests when necessary. Congress now wants to outlaw the experiments altogether. On Wednesday, Titus introduced the Preventing Unkind and Painful Procedures and Experiments on Respected Species (PUPPERS) to end what she called this "barbaric practice." "There are proven alternatives to this unnecessary testing that inflicts severe pain on puppies and dogs while producing no discernible medical advances," she said. The bipartisan bill has 60 co-sponsors, including Florida Republican Rep. Brian Mast, an Army veteran who lost both of his legs in Afghanistan. "While I was recovering from my injuries, I saw firsthand the important role that dogs play in helping veterans recover from war's physical and psychological tolls," Mast said in a statement. "For too long, the VA has gotten away with conducting these harmful — sometimes fatal — experiments on dogs. These tests are abusive, waste taxpayer dollars and must be stopped." The lawmakers' push has some high-profile help with White House ties. Lara Trump, the president's daughter-in-law and an adviser to his re-election campaign. The animal advocate told USA Today the experiments are "cruel and ineffective" and should be stopped.